As I sit here planning Quiz And Survey Master’s goals for 2018, it is important to look back at 2017 to evaluate our goals, successes, and failures. I know many of QSM’s users are in a similar position in their business as QSM so I decided to share all of our data from 2017. I will share our numbers for revenue, expenses, site stats, emails, and more. I hope that you find this beneficial and can use some of these insights in your own business. As many of you know, I went through a major divorce that occupied much of my time and thoughts during the end of 2016 and the first half of 2017. This caused QSM to fall well behind in its trends and goals. With a lot of work in the second half of 2017, I have gotten the plugin close to getting back on track but it still has some ground to recover. I didn’t realize how much a stressed personal life can affect business until I was reviewing some of my numbers from a variety of my projects, including QSM, and found that I was well below all of my goals and estimations. I’ll post a more detailed post about mental health over on my personal blog but I highly recommend you look into mindfulness and mental health, especially if you are running your own business. QSM started out as a very simple quickly made plugin back in 2009 called “Quiz Master”. I then didn’t touch the plugin until 2014 when I worked on a new site. I re-wrote the entire plugin and called it “Quiz Master Next”. At the end of 2014, I made my first addon sale for $9. Since then, the plugin has grown quite a bit and is used by thousands of users around the world. Since its first released, the plugin has been downloaded over 300,000 times including new installs, downloads, updates, and dev sites. We recently passed the 20,000 active install milestone which is almost 200% compared to where the plugin was in 2016. 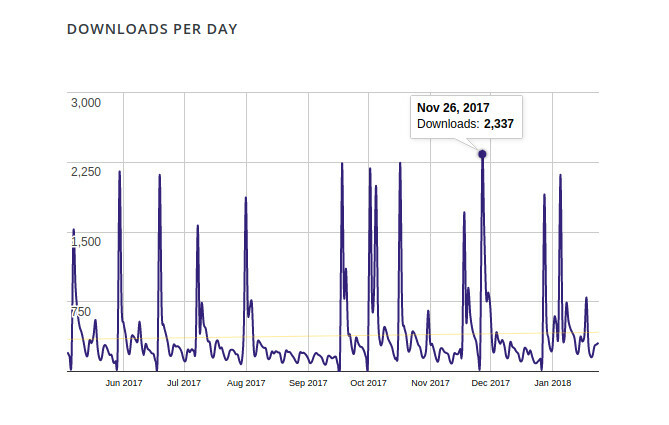 There have been multiple days where QSM was downloaded over 2,000 times (including new users and updates) with the most in one day being 2,337. All of our development takes place over in the GitHub repo. There were over 150 commits for the main QSM plugin during 2017 which allowed us to close over 40 issues. QSM had 5 new addons released including Google Analytics Tracking and Simple Popups which brought the total to 27 addons. Of the 27 addons, 15 had major updates released which closed out dozens of GitHub issues. As the plugin has grown, I have quickly realized that 1 person alone cannot build an ecosystem. Earlier in the year, Gary joined the team to assist with migrating our documentation to our new system which included easier to use navigation and search. While he hasn’t been an active member of the team lately, he will be making more of an appearance in future months. If you have created any support ticket in the last few months, you may have met Troy. In the fall, Troy joined the team as our new Support Guru in a very part-time capacity. Of course, supporting 20,000 users is a lot more of a task than I realized so he is quickly working more hours and we are in the process of finding another support guru to join the team. There was one other hire over the summer. I had wanted to bring someone onto the team to assist with marketing and growing the user base. However, I failed to create a concrete plan for this new hire to execute on so this venture did not work out. Something important I learned was that you cannot expect a new hire to jump in and improve something that doesn’t have any process or plan. You must have a plan before hiring. So, when I went to hire Troy, I made sure I had entire processes mapped out for support and what to do in different situations. This has drastically helped onboard Troy and set him up for success. I don’t think there was a single time in 2017 that we were completely caught up with our support tickets. I had trouble committing to a lot of time in the spring due to my personal life and have had trouble catching up. Luckily, we are almost to the point where everyone is getting a response. It still takes way too long to get a response but we are getting closer to my goal of getting the initial response within 24 hours. My big goal this year is to get to the point where we can have a 24-hour response guarantee. All of our support tickets are handled inside HelpScout. We had a total of 4,326 support tickets created from 2,384 different users during the year. This resulted in over 10,000 emails being exchanged! Unfortunately, tickets had an average resolution time of 5d 15h which means it took over 5 days of back-and-forth emails to get an issue resolved. This is the metric we are focused on reducing in 2018. Most of our our sites, including this one, is hosted on Flywheel and we use Google Analytics to monitor the site’s traffic. On average, we had about 4,500 pageviews per day. These came from a total of 89,500 sessions from 47,408 users! Over half of these views came from links from within the plugin such as the “Addons” page or the “Help” page. The top link from within the plugin is the documentation link on the “Help” page. The other top links from within the plugin are the Landing Page, Export Results, and Reporting And Analysis addon links on the “Addons” page. The top referral for our site is the 5+ Best Free WordPress Quiz Plugins post on Small Envelop with over 1,000 site visitors coming from that post. While we have switched email hosting providers many years in the past, Drip has been our provider all of 2017. On our email list, we have over 8,000 subscribers! In our main email campaign (automated emails that get sent out upon sign up), our average open rate is 32% which is higher than industry average with 2% of people clicking on the links. As the business has grown, so has our expenses. A lot of this comes from software and hosting as well as team payroll. Now that we talked about all the aspects of the running QSM, let’s talk revenue! For 2017, Quiz And Survey Master made $47,933.00 from 1,670 sales. This is up 50% from 2016! Something important to note is that the free Certificate and Leaderboards addons count as sales. Removing the sales of the free addons, the average sale is $62. As you can see, we continue to have a bit of a drop in July. It was not quite as drastic as years prior but was still significant. Of course, now that I have done this for a few years, I knew to plan accordingly. I am a little surprised to see the Export & Import addon on there as that is a fairly recent addon. That shows how much QSM may have been missing by prioritizing some of the other addons over that addon. Even though I had a rough beginning to the year, I would consider 2017 a successful year. We didn’t reach the goals I had outlined but we still made great progress. We were up 50% in revenue and expanded the team beyond just me. We passed the 20,000 active install milestone as well as the 300,000 download milestone. Grow the monthly revenue to $10,000 monthly. I realize this is double our best month in 2017 but I have many major updates and addons planned for 2018 and think we can hit that number at least once. Grow the active installs to 30,000. Get support tickets first response within 24 hours. Hire at least 2 more part-time people to assist with the support and development of the plugin and its ecosystem. With a plan in place, I can set my review of 2017 down and continue looking forward to our next update. At over 1,500 words, this review became a bit bigger than I anticipated. I hope you read all of this! Leave a comment with your feedback and how your 2017 went!